Dionisio Aguado was a Spanish classical guitarist and composer. Born in Madrid, he studied with Miguel Garcia. In 1825, Aguado visited Paris, where he met and became friends with lived with Fernando Sor. 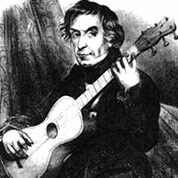 Aguado’s major work Escuela de Guitarra was a guitar tutorial published in 1825. Dionisio Aguado has attained lasting fame through his method for guitar, which is still in print today.